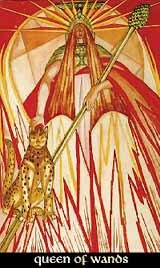 Personifying the waters in the element of Fire, the Queen of Wands has a similiar basic as the Knight of Cups, combining opposing elements when neither of the contrasts can overcome the other, thus having an unstable balance between them. As a queen, she is the mother of her element, the emotion and the sensitivity, thus having her attributes of love, understanding and sympathy, her abilities to form and create, spending trust and warmth. The fiery character provides pride, passion, inspiration and powerful independence, her charisma, strength and expansiveness. Due to the imbalance in her character, the Queen of Wands can easily shift to her dark side, becoming a hot-tempered, revengeful fury, overdominant and possessive, taking the tiniest bit as a reason to bear an grudge for years. She never forgets and never forgives, and as easily her fiery temper makes her forget own mistakes, so deeply her watery depths can cause her to ponder long and broad about the mistakes of others. Missing the stability of earth and the logic of air, tolerance and self-control never were her best disciplines.